I’m constantly buying different skin care products that never seem right for my skin. I go from dry one week, to oily the next and never seem to see a result! Apparently women individually spend around £1,400 a year on beauty products (and I’m pretty sure my personal spend is much higher!) so it seems that skin care is something we invest heavily in, but is it a worthy investment? After chatting to my friends and colleagues it seems it’s a common problem- we just don’t know what our skin really needs. 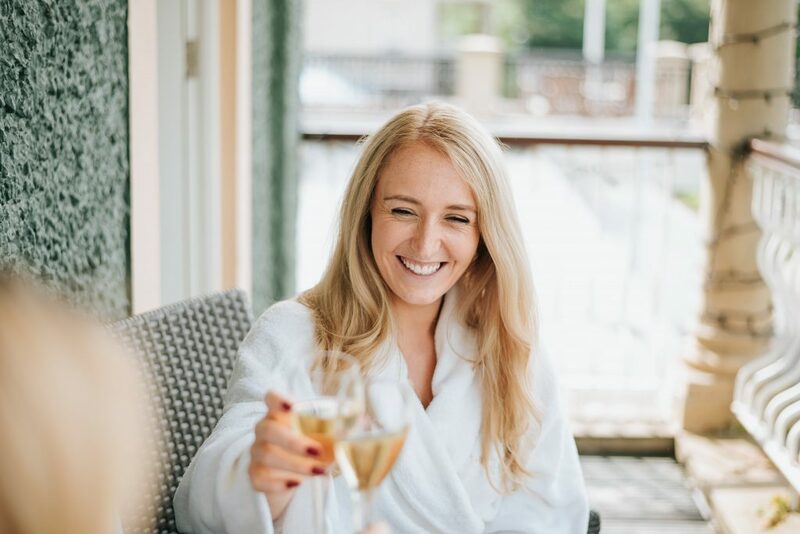 I booked myself in for an ELEMIS facial at The SPA Hotel and got chatting about my experience with one of the therapists. This is when my skin care world changed! The therapist recommended the ELEMIS SkinLab… your very own customised skin prescription! 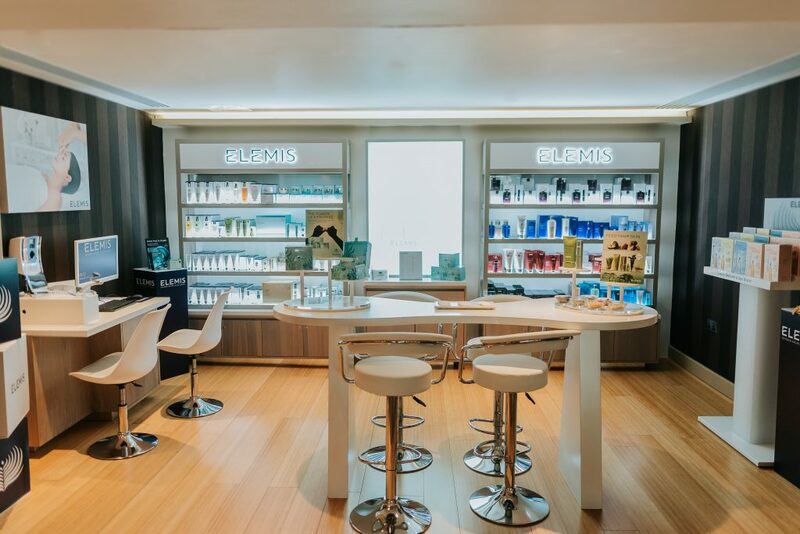 The ELEMIS Skin Lab is a magical machine designed to determine the perfect solutions for your individual needs… put more technically it is state-of-the-art technology that will target areas of the skin by taking six 3D images, highlighting damage, brown spots, red areas, texture and more. 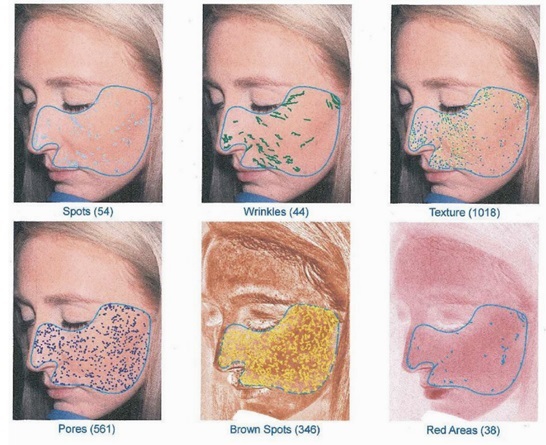 This 3D skin and facial mapping analysis uses clinical imaging giving you insight into where your skin needs attention by analysing a range of popular skin concerns such as wrinkles, blemishes and sun damage. It sounded fantastic and apparently I would be able to see the results in just 15 minutes! I took to the chair and was asked to place my chin on a comfortable rest. The camera was aligned with my face and the therapist took six close-up images of my skin… but under the surface! Clever stuff! The results were intriguing. Each image displayed an insight into a different common skin complaint. Based on the level of colour, or number of dots, I could determine what it was my skin was in need of, and of course, where my skin was nice and healthy! Image 1: SPOTS – All imperfections are highlighted in blue, even those that you cannot see by the eye. Image 2: WRINKLES – Skin folds and wrinkles will be identified on the images with a blue line. Image 3: TEXTURE – Variations in surface texture reveal the skin’s plumpness (using yellow dots) or dehydration (using blue dots). Image 4: PORES – Pores are surface openings and if dirt and grime accumulates it can result in skin breakouts. The image highlights the size and amount of pores in your skin that are hard to see by just using a mirror. Image 5: UV BROWN SPOTS – Measures sun exposure via yellow highlights. Your therapist can recommend what is a healthy amount of sun exposure. Image 6: REDNESS – Determined by different shades of red on the images, this detects vascular features, vascular changes within the skin ie Acne, Rosacea, Broken Blood Vessels and High Colour. As you can see it was a pretty detailed analysis of my skin! The therapist explained my skin problem areas and recommended which products and treatments will help combat them. I got a full insight into the products that work for my skin and left clued up on how to take care of my skin going forward. I’ve stuck to my routine and have never been happier. Instead of wasting money on products that are just not right, I’ve invested in products that work for my individual needs, and it is money well spent! Forming part of the new enhancements, The SPA Hotel has introduced the ELEMIS SkinLab and Skin Consultation as a permanent feature. Book a 15-minute consultation using the ELEMIS SkinLab Technology for just £15 and let the state-of-the-art technology, and experienced therapists recommend what treatments and products really suit your skin!